Hello and WELCOME! Spring has officially sprung, even in New York! 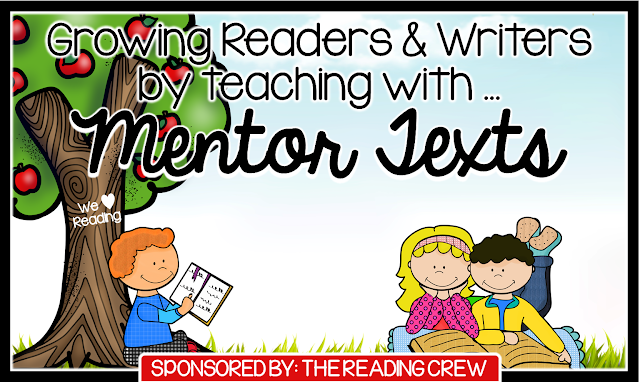 I am incredibly honored to be joining The Reading Crew for our Spring Mentor Text Link-up. We will be sharing a Spring mentor text lesson, using a book we've chosen. The lesson will model a vocabulary, comprehension or writing skill. The resources shared may be forever freebies, or may only be free for a limited time. Please take note of this as you visit the blogs. When you think of Spring, what comes to mind? For me, the memories of putting on my rain boots and jumping in puddles rush back. 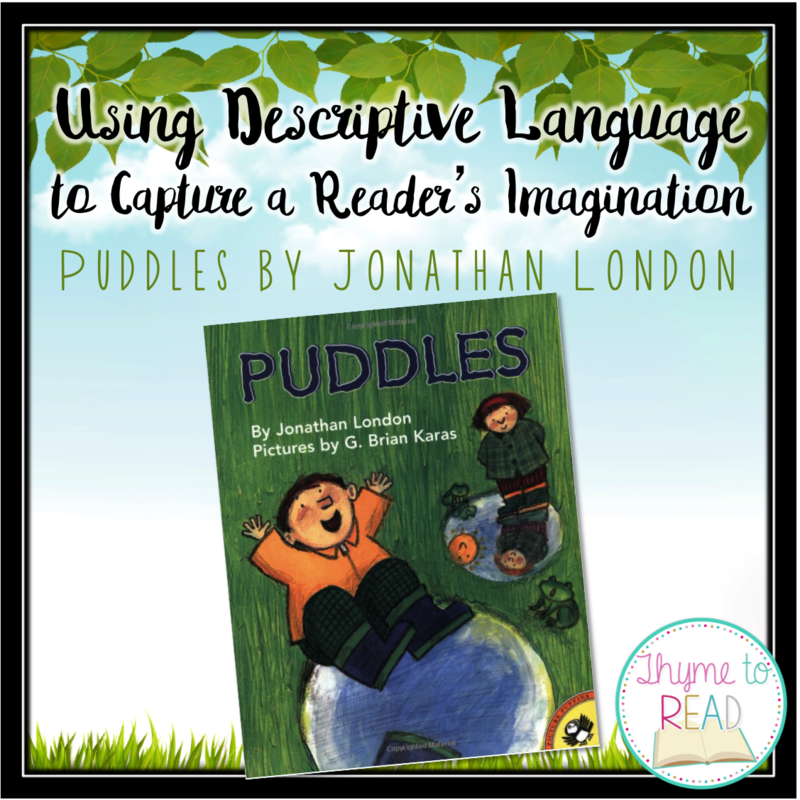 Jonathan London uses fabulous, rich language to capture the reader's imagination and memories (or fantasies) of puddle jumping. 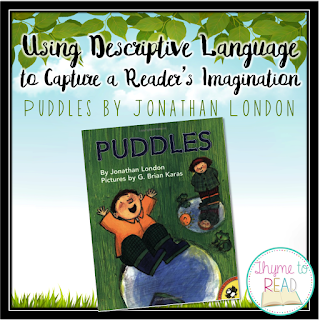 Puddles by Jonathon London tells the story of two children who fearfully, yet excitedly experience a Spring thunderstorm. In the morning, they head out to explore, while their mother instructs them to "Watch out for puddles." The children notice the changes in their surroundings after the storm, especially the puddles! The colorful, two page spread illustrations enhance the already descriptive language and carry the children around while they experience the beautiful aftermath of the storm. Finally, the children return home ...WET! Prior to reading, your students would benefit from having some understanding of descriptive language. Take some time prior to reading this text to discuss the types of descriptive language (similes, metaphors, adjectives, and other types of figurative language). During this time, be sure to emphasize and model how descriptive language helps to support the visualization strategy. To engage your students prior to reading, you could begin by asking about their favorite signs of Spring. You can brainstorm a collaborative list (this list will come in handy for a lesson extension activity) and deepen the discussion by having them describe those signs in more detail. For example, birds returning is a favorite sign of spring and I know they have arrived when I can hear them chirping outside my window in the morning. I also connect with the bright red chest of the robin, and seeing that bird return, is a special symbol of Spring. If one of your students shares a connection with jumping in puddles, or rain, you have your hook all set! However, you can always share your favorite rain boots story to set the stage for this text. During reading, you may choose to not show the illustrations (even as colorful and playful as they are), they help to elude to the intended meaning of some of the descriptive language. While reading, stop once to model what you visualize based on the figurative language, and occasionally stop to encourage students to discuss their visualizations as well. 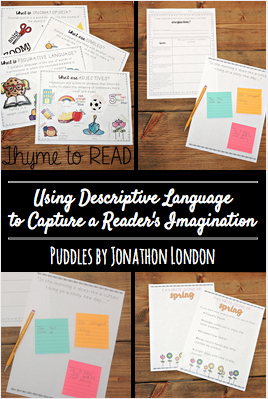 What your students will be visualizing is the author's descriptive language at work. This is exactly what we want for our students to be understanding and exemplifying in their writing! After reading the text one time through, ask the students what captured their imagination? Ask if any particular experience of the characters' day stood out to them, and why? If your students are like mine, they will probably be most drawn to the pages with descriptive language. In the following activity, your students will collaboratively work to understand the descriptive language in the text. To access your freebie, click HERE. This is for the collaborative carousel activity. Here your students will work in small groups to identify the author's intended meaning. Collaborative carousel activities are so much fun. My students LOVE them. To complete this activity, post the four posters around your classroom. Group the students in small groups of mixed ability level, and assign them a starting point. At each poster, the group will read the quote and share their ideas for the author's intended meaning. Together as a group, they will need to determine that meaning and write it on a post-it note to be left behind on the poster. I find that approximately 5 mins at each poster is appropriate for this task. When a timer goes off, the group moves to the next poster. This time, they read the quote first and also the response(s) of the other groups. This procedure continues until all groups have read and analyzed each quote. Following the carousel activity, review student responses with the class to confirm or fix up misunderstandings about the descriptive language, and the author's intended meaning. This would be the perfect time to show your students the illustrations. As a BONUS, I have included a Common Core aligned lesson outline. For a full set of resources (including a brainstorming page, descriptive language anchor posters, writers block suggestions and a writing response page), you can click the picture below to purchase it in my Teachers Pay Teachers store. To further extend this lesson, return to the brainstormed list of favorite Spring signs. Allow your students to choose one of the ideas on the list, or brainstorm others, for which they can write about using descriptive language. By providing your students with the opportunity to read, interpret and have a deeper understanding of descriptive language, (hopefully) it is something they will feel more comfortably using in their writing. This post was part of a mentor text link up hosted by The Reading Crew. On each blog, a Spring mentor text lesson using a book and focusing on a vocabulary, comprehension or writing skill has been featured. The posts and resources from The Reading Crew, never disappoint, and this time was no different. Check out all the posts below. What a fantastic blog post and resource! Thank you Jenn! So glad we could connect and this Reading Crew is supportive. We can never have enough resources to practice this challenging concept! This is amazing. Thank you! Julie, you are so right. Thank you for stopping by and a BIG THANK YOU for sharing your resources as well. I love your extension idea as well! Thanks Daliene! So glad you popped over to say Hi! I would love to win the GIVEAWAY! I'm entering now! Great posts!Thanks for sharing! Best of luck! It was my pleasure. Thank you for checking out all of the blog posts and freebies. So happy that your first post was our hop, and you started off with a great one! Hoping you enjoy your blogging journey! Thanks for your lesson idea and freebie. I love teaching writing, and this will be fabulous to use. Carla, thank you for the support and encouragement. The wealth of knowledge and connections I have made through this passionate group of literacy educators is amazing. Thanks for bringing us all together to share! My students love Post-It notes and chart paper! We will for sure try your carousel activity after our holiday break! 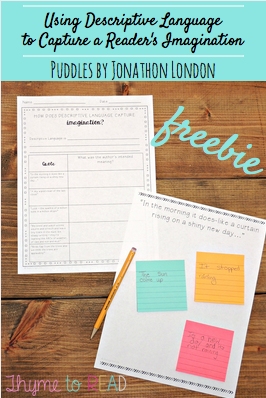 I need to add PUDDLES to my mentor text library! Thanks so much for sharing your great ideas! Jennifer, who doesn't love Post-It notes!? Please let me know how it goes, and enjoy your break!! !